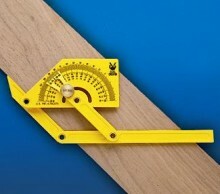 Protractor/angle finder to measure and mark the degrees of an angle on outside, inside and sloped angles. Fine black graduations from 0° to 165° in opposite directions. Click the button below to add the Angle Setter / Protractor, 6 Inch Blade to your wish list.